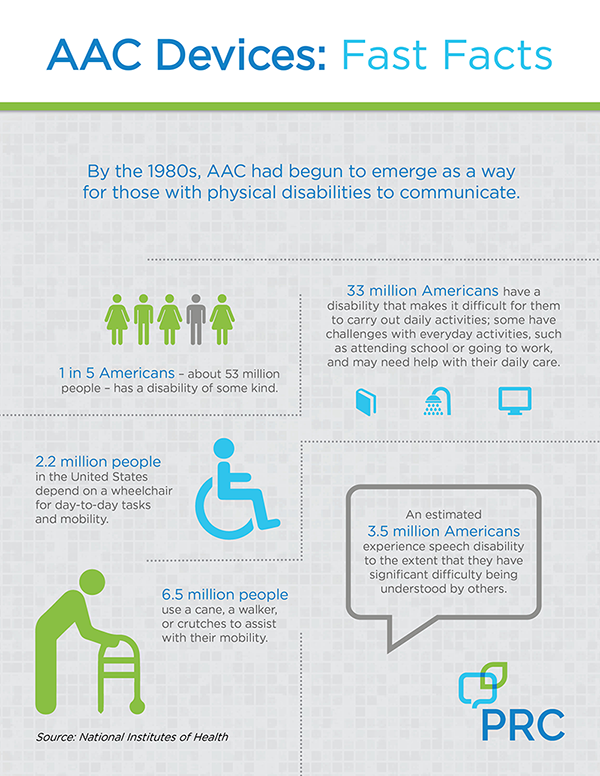 Join PRC as we celebrate AAC Awareness Month! All this month we'll be posting infographics, success stories, facts, FAQs and more about AAC. 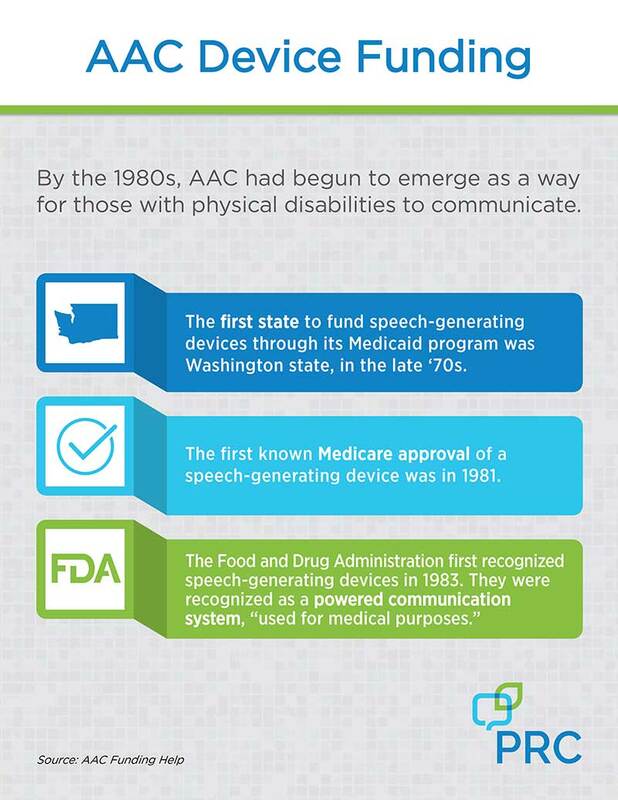 Bookmark this page and check back often and discover how AAC has helped children and adults to communicate, learn the history of AAC and a whole lot more. Click the image to download a full-size graphic. The first electronic communication aid was a sip-and-puff typewriter controller prototyped in 1960 by Reg Maling of the U.K. Named POSSUM, for “patient operated selector mechanism,” the device scanned through a set of symbols on an illuminated display. 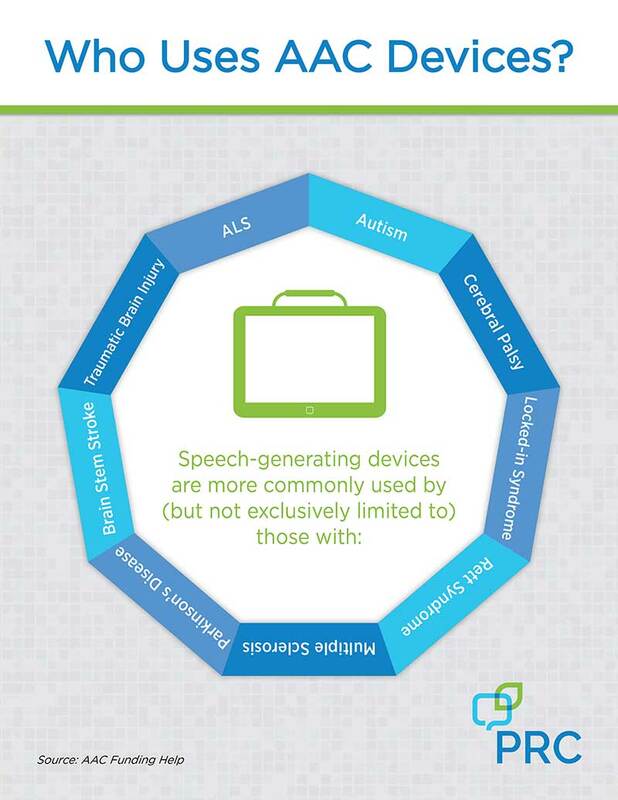 Last week, we recorded a webinar with Lance McLemore on AAC and Autism. Lance is an adult with Autism who shared his story, offered advice to families about using AAC at home, and answered questions from the audience. This is worth a watch, or rewatch! In 1970, researchers at Delft University in the Netherlands created the first use of head pointing technology with the LOT, or “lightspot operated typewriter." Dr. Caroline Musselwhite’s website AAC Intervention is an abundant resource of tips, products, and presentations from this well-known AT Specialist with years of experience working with children & adolescents with severe disabilities. PrAACtical AAC is a blog that supports a community of professionals and families who are determined to improve the communication and literacy abilities of people with complex communication needs. They're funny, sad, touching...but all of them are stories of those who use AAC to express themselves. Meet our device users, who aren't afraid to tell the world who they are! Caroline: Rett Syndrome Doesn't Slow this Girl Down! Author, painter and poet Christy Brown (1932-1981), the subject of the book and movie My Left Foot, was born with cerebral palsy. Despite this, he went on to write nine books and paint using his left foot (hence his autobiographical title) and achieved international notoriety.